Hermes ex libris scarf navy blue horse and cart design possibly cashmere? HERMES BLUE SUEDE LACE UP ANKLE BOOTS SIZE 43 9 UK . Vintage Hermes paris Neige D'antan Silk Scarf by Caty Latham 17"
Hermes scarf , FLORA GRAECA , unworn , with ribbon and box. Hermes silk scarf 90cm x 90cm. Sous les Orangers. New Without Tags.Original Box. Hermes scarf , CLIC-CLAC New with ribbon and box. 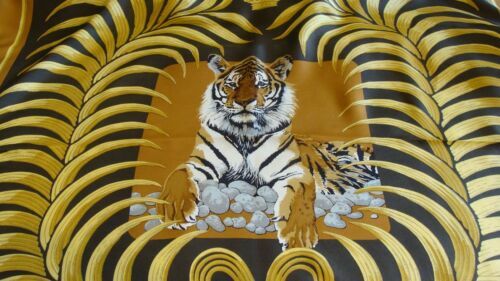 Hermes silk scarf, TIGRE ROYAL NEW, with box.